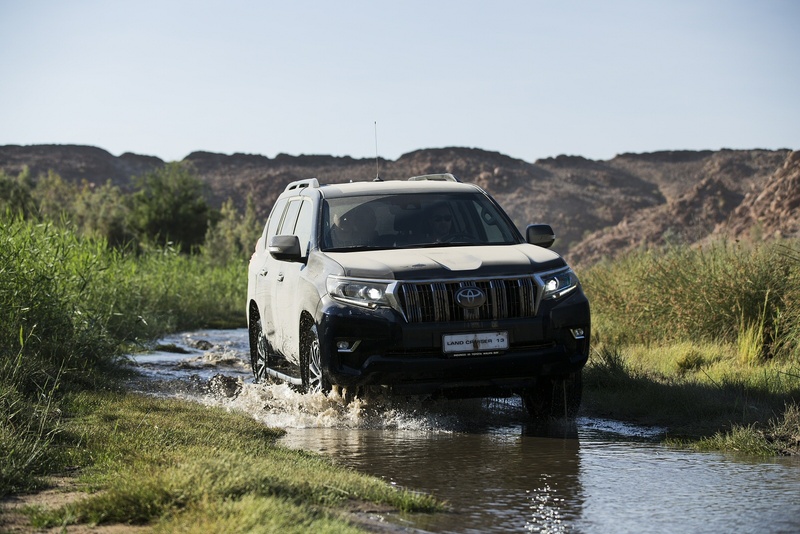 Many serious off-road vehicles are about as comfortable as going over Niagara in a barrel when used on the road, but Toyota's Land Cruiser is one champion mud-plugger that can hold its own on the tarmac. The latest model enhances this reputation with sleeker exterior styling, a more sophisticated, comfortable and higher quality interior, plus improvements to its dynamic performance and user-friendliness, both on and off-road. When it comes to reputation, there's little that can touch the Toyota Land Cruiser. It's the most indestructible of all big 4x4s and has spawned its own legend. Australian backwoodsmen tell you that if you need to get to where you're going, buy a Land Rover. If you need to get back again, choose a Land Cruiser. Here in the UK, however, there's often little requirement for a vehicle that can ford swollen rivers and wade up to its axles in mud. It's not that we're lightweights. We just require a little more versatility. The latest Land Cruiser responds to that call. Yes, it can still take you wherever you choose to go once the tarmac runs out, but now it's a much more pleasant place to be for the majority of the time it's being used as a car rather than a cross-country assault weapon. It's hard to mess with a legend that has over 60 years of heritage behind it. Has Toyota been successful? 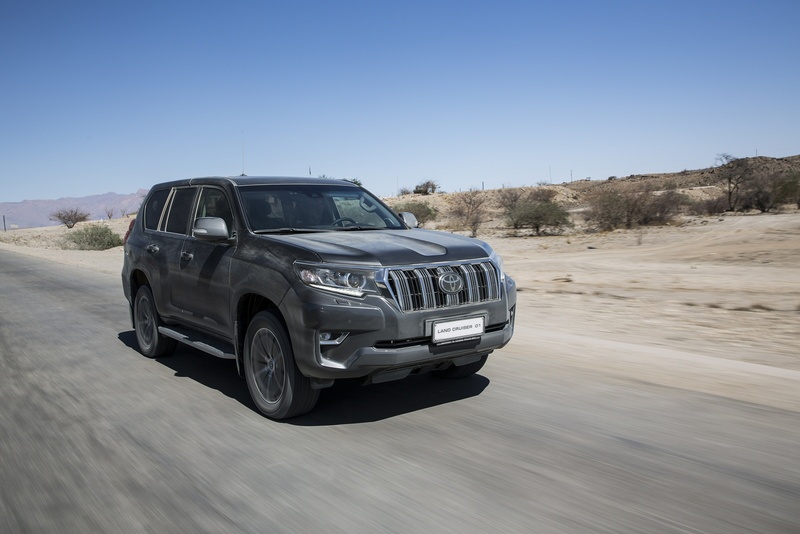 The 2.8-litre D-4D diesel engine is the only one we get in our market for Land Cruiser models and it boasts 175bhp and a lusty 420Nm of pulling power through the gears. There's a choice of a six-speed manual gearbox or smooth six-speed automatic transmission. There's an extra 30Nm of grunt available between 1,600 and 2,400rpm, so overtaking is easier than you might expect it to be in a large, heavy serious 4x4. 62mph from rest takes 12.0s - or 12.7s in the auto. That said, a performance SUV this is not. This doesn't mean to say the Land Cruiser need be hard work to drive. Suspension modifications made in recent years offer an improved balance of stability and ride quality. This applies both to the standard set-up and the Kinetic Dynamic Suspension System featured on higher grade models. On the standard system, damper performance has been optimised, while the Kinetic setup benefits from an increase in thickness/diameter for several components, including the front anti-roll bar to create smoother vehicle behaviour with better front-to-rear weight transfer when cornering. This on-road refinement hasn't come at the expense of off-road ability though. That's sacrosanct and Toyota only green lights developments that can benefit both roles. 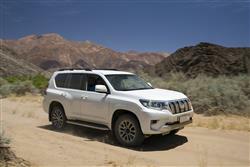 Though the Land Cruiser's styling is as rugged as ever, it has a smarter, more contemporary feel in this revised form. As before, there's an entry-level three-door short wheelbase variant, but most customers opt for the five-door seven-seat long wheelbase derivative. In both cases, the overall length has been increased with the revised design package - to over 4.8m in the case of the five-door variant. The bonnet, grille, headlamps, bumper and wings have all been re-styled, organised into single, powerful graphic and set higher for better off-road functionality. The grille's apertures have been made as large as possible for optimum engine cooling, while the headlamp main beams are positioned inboard to avoid damage when driving off-road. In profile, the peak of the front bumper has been raised, while fresh elements at the rear include a redesigned lamp cluster with an LED stop light and a restyled bumper. Inside, the smarter dashboard incorporates classier instrument binnacle. The centre console's revised too and its top has been set lower for a sleeker appearance and better front-on visibility when driving off-road. The redesigned instrument binnacle has a four-gauge layout with precision Optitron meters that flank a 4.2-inch TFT colour multi-information display. There's also smarter white illumination for the instrument panel, centre console and door-mounted switches. This cabin lighting scheme uses LEDs for the front footwells, headlining, glove box and door panels. Space for those in the second row is quite plentiful and access to the rearmost third row seats is straightforward thanks to a generous 46-degree angle for the middle bench. You can fit properly-sized adults in the very back too; these pews aren't just for kids. If you want the best, you tend to have to pay for it and the Land Cruiser has never been conspicuously cheap. To try and make it look a little more affordable, Toyota has now introduced a new base 'Utility' trim grade, priced from around £33,000. If you need a bit of luxury though, you'll want the usual 'Active', 'Icon' or 'Invincible' grades, which start from about £39,000. Equipment levels have never been a Land Cruiser Achilles heel and the latest range doesn't want for standard kit. All variants come equipped with DAB digital radio and most owners want the 'Toyota Touch 2 with Go' set-up, which adds intuitive and comprehensive navigation functions to the vehicle's high-resolution, touchscreen-controlled multimedia system. Customers can also specify leather seats for the vehicle - which are standard with the flagship 'Invincible' grade. Safety provision has been much improved thanks to the inclusion of Toyota Safety Sense active technologies. These include a Pre-Collision System (PCS) with pedestrian detection function, Adaptive Cruise Control (ACC), Lane Departure Alert (LDA) and Automatic High Beam (AHB). Further driver support is provided a Blind Spot Monitor with Rear Cross Traffic Alert and an upgraded tyre pressure warning system. You wouldn't exactly call the Land Cruiser efficient - but these days, it's a lot cleaner and more frugal than it used to be, mainly thanks to the switch from 3.0-litre to 2.8-litre D-4D diesel power a few years back. For both manual and auto models, the combined cycle fuel economy is rated at 39.2mpg and there's a CO2 figure of 190g/km, these returns for the five-door model. That's still a way off what you'd get from cheaper but less rugged rivals like Kia's Sorrento and Hyundai's Santa Fe, but it's about the same as you'd get from comparably tough competitors like Mitsubishi's Shogun and SsangYong's Rexton. An Eco Driving Indicator is there to help owners get somewhere close to the published figures. It'll be expensive to tax then - but at least residual values are and will stay very strong: expect around 52% of your original purchase price back after the usual three year standard ownership period. That's thanks to the relatively low numbers sold, this car's bullet-proof quality and its loyal following. Insurance groups are pitched at 31 for the three-door and five-door five-seat models. And group 34 for the rest of the range. As before, maintenance costs can be kept down thanks to a fixed price servicing plan. And there's a 5 year/100,000 mile warranty that you'll almost certainly never need. If you�re looking for a new Toyota Land Cruiser 2.8 D-4D Icon 5dr Auto 7 Seats [Off Road + JBL] Diesel Station Wagon for sale, you�ve come to the right place. 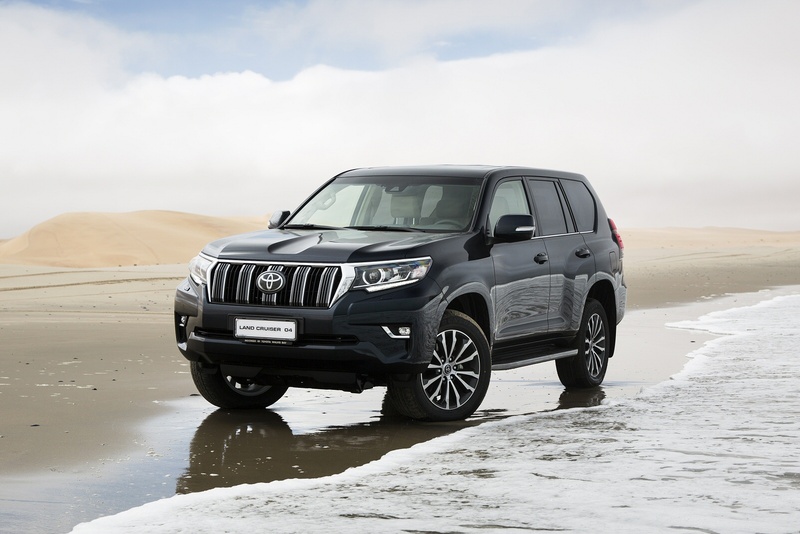 At Bristol Street Motors we don�t just have the best Toyota Land Cruiser 2.8 D-4D Icon 5dr Auto 7 Seats [Off Road + JBL] Diesel Station Wagon deals, we also offer friendly advice and help with all your enquiries to ensure your buying experience is a happy experience.